Mad Max: Fury Road isn’t exactly a romantic film. It brims with blood, oil, and dust, but romance? Not so much. However, George Miller’s Fury Road set was apparently the site of an adorable love story. Dane Grant and Dayna Porter—who worked as stunt doubles on the film for Tom Hardy and Charlize Theron, respectively—met on the Mad Max set in Namibia back in 2012. Now, they’re married. The stunt professionals shared their story with Stuff.co.nz: “I saw Dayna straight away—she was the only girl from New Zealand and she stood out like a sore thumb,” Dane said. Porter previously doubled as Theron in Snow White And The Huntsman, part of a lengthy stunt career that goes back to Hercules: The Legendary Journeys and Xena: Warrior Princess, where she was one of three stunt doubles for none other than Lucy Lawless. She has also worked as Gwyneth Paltrow’s double. 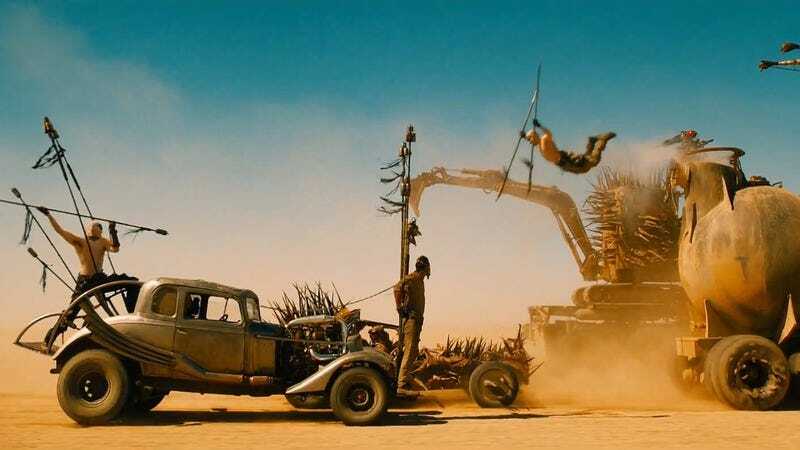 Grant is newer to the industry, and was actually filling in during Mad Max rehearsals for Jacob Tomuri, who was eventually hired as Hardy’s main stunt double. According to Grant, even though it sounds cheesy, it was love at first sight—and first fight. “While we were punching each other we were falling for each other—quite rapidly,” he said. The two agile lovebirds married in 2013, and Grant helps run the New Zealand-based stunt school Porter opened in 2010. They also have a 14-month-old son together, who apparently is starting in early on the family business.